I’ve never been fond of flavored pastas. Fresh tomatoes are never bitter when you chop them up and add them to a sauce, and you'd be hard-pressed to use too much fresh basil in an Italian dish. But for some reason when the same ingredients are solidified into flour and water more often than not they taste off to me; resinous herbs like rosemary or thyme end up with a slightly medicinal edge. Saffron is different. 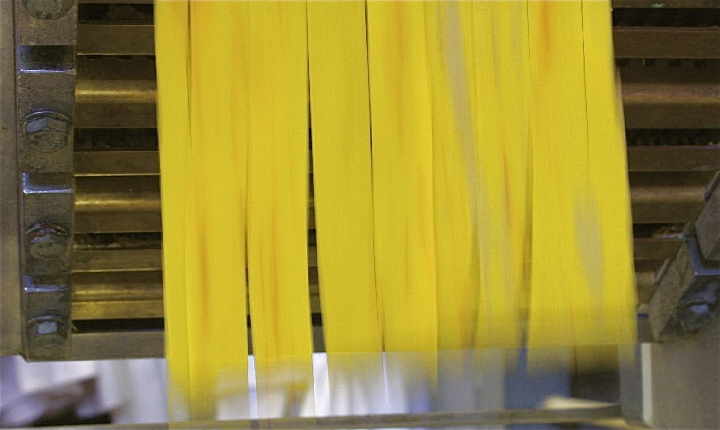 All it adds to the taste of fresh pasta is a slight floral note, but more importantly it brings back the glorious color of the egg yolks ~ always doomed to be lost in the white blur of flour, salt and milk. Saffron brings that yellow back to the front, where it belongs. It's also the color of the sun, which makes me think of wheat in a field. Everything about Italian food references the simple beauties of nature; it is the earthiest cuisine, the most able to satisfy the base comfort I look for in food. I admire French presentation and technique, I crave Indian and Thai, but it's Italian I return to when I've had a bad day or just need that little bit of mama in my soul. To get that splendid color, saffron threads are added to white wine which has been brought almost to a boil, a process called 'blooming'. 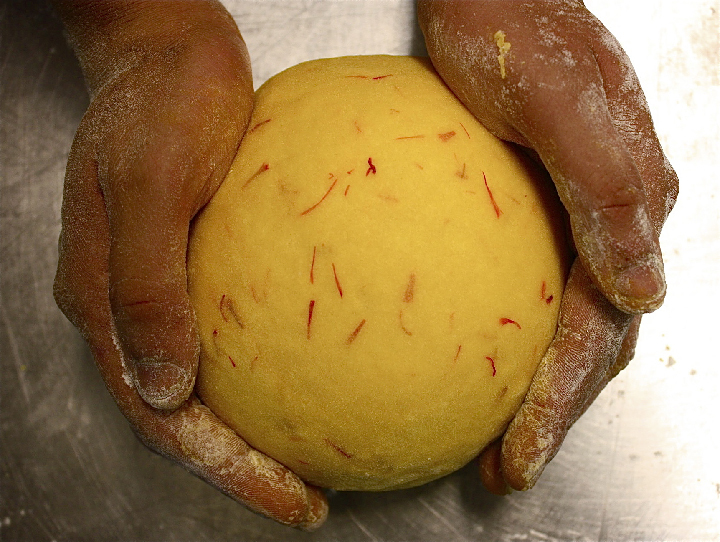 As the saffron dissolves you cool it over ice water, leaving some threads intact, then add to the egg yolks. We use a classic old machine Geoff rebuilt for us to cut our dough, but we always start by mixing and kneading our pastas by hand which demands time and patience, a good practice in a kitchen like ours where speed under pressure is constantly required. There's also a sound technical reason for making pasta by hand rather than dumping all the ingredients into a big machine. Pasta is all about texture. You need to feel it as you go; to learn to trust your fingers when they tell you more, or tell you stop. Which, in a round about way, brings me back to my comment about nurture and comfort. To have an abundance of both in life, you need to be hands on. Paul Bertolli, a friend from the early Barndiva days, wrote what I still consider a benchmark Italian cookbook no kitchen should be without called, appropriately enough, Cooking by Hand. Written in essay form with chapters like Twelve Ways to Look at a Tomato, it's not a book you pick up when you need a quickie recipe, but one you linger over in bed before you fall asleep. With any luck you may find yourself in a dream where you have miraculously found the time to work the dough, cut the tomatoes, rip the basil, crush the oregano, taste the wine. Only a few chef-writers capture the magic of why we cook ~ MFK Fisher comes to mind ~ by managing to tap into our culinary soul. Paul finds the magic. Chef served Rabbit with the Saffron Fettuccine this week: kidneys, loin, and rack, beautifully butchered then flash seared in butter and garlic and thyme. Wish I could say “just like the mama used to make,” but with no disrespect to my mother, I grew up thinking rabbits were girly pets, pasta only came in boxes, tomato sauce only came in cans. I’ve since learned that it’s usually the time it takes to do things simply that matters most when it comes to food. Happily, the joy of Italian food is that when you use great ingredients and put your heart into it, wherever you started on your food journey you can end up making your own delicious traditions. As it happened I attended two Harvest Festivals this week. The Mendocino County Fair, held in the Boonville Fairgrounds ten miles from our farm, has been going strong for 87 years (we’ve been attending, on and off, for the past 30). The National Heirloom Expo, held amidst great fanfare (and high expectations) at the fairgrounds in Santa Rosa is brand spanking new. Besides the fact that both the Fair and the Expo are at heart celebrations of all things grown and living, from inception to delivery they were radically different events. The Mendocino County Fair opens with a rodeo and ends with a parade down Hwy 128 with people and horses in fancy dress; it boasts an impressive collection of award winning animals, rides, cotton candy and hot dogs on a stick. No one cares where the hot dogs come from. It’s simply a fair all about fun, and the folks that put it on, from the 4H and FFA kids who raise the animals to the women who bake the pies from the (fast disappearing) apple orchards of Anderson Valley work hard all year long to make it happen. The fair celebrates their labors and their lives ~ it's not about thinking deeply about farming methods or where the seed they use to grow their food and feed their animals comes from. It's about taking three days off in September to stand back and go, phew, can you believe we made it through another year? Pass the popcorn. There were no rides at the National Heirloom Expo. There was a mind boggling array of open pollinated fruits and vegetables, food vendors clearly vetted for where they sourced ingredients (not a hot dog on a stick in sight), a giant tower of squash (by the same folks who built the squash tower in Michelle Obama’s White House vegetable garden) and an entire hall filled with non-profit (read: optimistically struggling) seed people. While there was country music and a convivial air in the crowds milling around the fresh produce stalls outside the halls, it was clear from the moment you pushed through the turnstile that unlike the Mendocino County Fair there was a decidedly political bent to this event. On Tuesday Ryan gave a cooking demo at the Expo in the Hall of Flowers with Alex Lapham of MIX Garden. The bromance these two extremely talented big guys have going, sustained by the superlative produce one grows and the other cooks, is something to behold. They did a reprise of their heirloom tomato and melon salad, bantering non-stop back and forth while I sat snapping away in the first row with Geoff and Chef’s beautiful wife Rebekah. Mick Kopetsky and Bryan Hohnstein, the other two parts of MIX Garden’s phenomenal success, stood at the back of the crowd grinning madly. It’s great when you can walk around a fair and connect with people whose livelihood is integral to your own: old friend Kristee Rosendahl was there with her exciting Smart Gardener website, new friends Belle Starr and Bill McDorman of Native Seed/SEARCH were there with their special varieties of Southwest seeds which they'd also brought to Barndiva for us to cook with. On Thursday night we returned to the fairgrounds to hear Dr. Vandana Shiva speak. Dr. Shiva is one of those rare human beings who can deliver a message that is dire, yet manage to take you to a place where you know you are up to the challenge. If you don’t know who she is, I urge you to go online and find out. 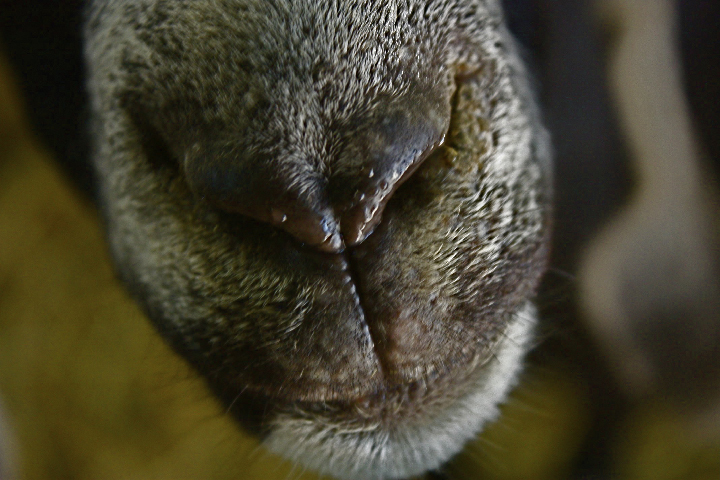 On Sunday we arrived at the Boonville Fairgrounds a half hour before the sheep dog trials began. Sheep Dog trials are my all time favorite spectator sport ~ if you have children trust me on this one, sheepdog trials hold a paradigm for your life. The trials this year delivered big time with great dogs and wonderful handlers (all but one of whom were women). After the trials we toured the animal tents and spoke to some of the kids who raised them, falling in love with a breed of pig we hope to raise at the farm. What I didn’t do this year in Boonville ~ that I’ve always done in the past ~ was visit the Apple Hall to see the stands filled with boxes of apples in competition. 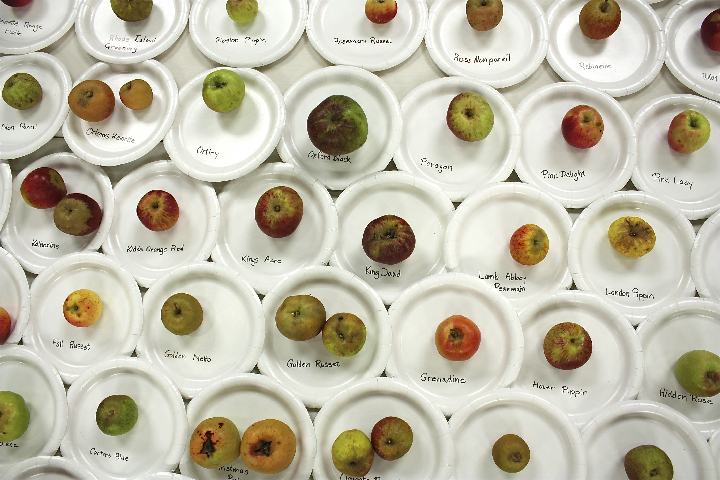 The Mendocino Apple Fair is a cherished part of my life’s traditions (Knowing More and More, about Less and Less) but it’s increasingly hard for me to reconcile the absence of awareness at this event. The organizers in Boonville ~ and 4H and FFA at the national level ~ could use a good dose of fire in the belly that drove the organizers and participants of the Heirloom Expo in Santa Rosa. This is one case where if worlds could collide we'd all be the better for it. 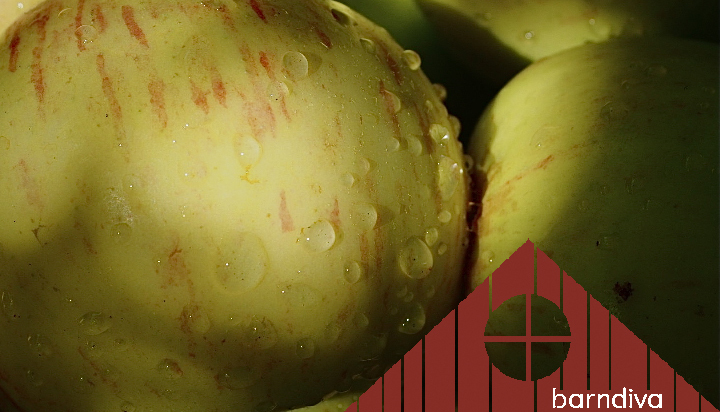 87 years ago almost all the apples polished to a shine at the Mendocino Fair were grown from diverse varieties, many brought to the valley with the immigrants that came over to work the forests before they settled down to farming and raising sheep. These days less than 10% of all the apples grown in the US are heirlooms, much less open pollinated, thanks to nefarious inroads made by Monsanto to control and limit seed varieties (for their own profit) which ultimately will imperil the world’s ability to feed itself. Much as I’d like to go to the Fair in Boonville and forget for a day about GM, forget about the 'legal' patenting of seeds, forget the damage chemical dependence is doing to our soil, forget about CAFO’s, I can’t get away from the feeling that mindlessness, even for a day, is no longer an option. For those of us whose lives depend upon the soil and the animals reared on it, hell, for anyone who eats, we do so at our peril, and at risk of losing everything we hold dear. We’ve come a long way since the days when garnishing a dish meant little more than throwing a bit of commercial parsley and a few superfluous vegetables on the plate, that quickly got pushed to one side. 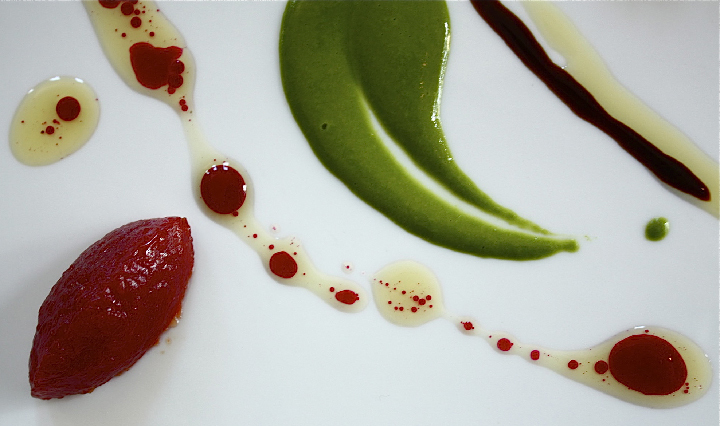 These days thoughtful chefs like Ryan have transformed our very notion of garnish, expanding the variety, colors and textures of the things they reach for in those last moments before a dish heads out to the dining room. To my mind, even the word is moribund ~ garnish has the potential to do a hell of a lot more than decorate a dish like a few accent pillows. They are the subtle but dramatic finishing pieces to a complex flavor puzzle a chef begins to fit together with initial conception of the dish. Consider the steps: raw ingredients are rubbed, cured, infused, marinated and seasoned before the cooking process bastes, sautés, caramelizes, bakes, flambés, glazes, braises, grills, barbeques or smokes in yet more flavors. 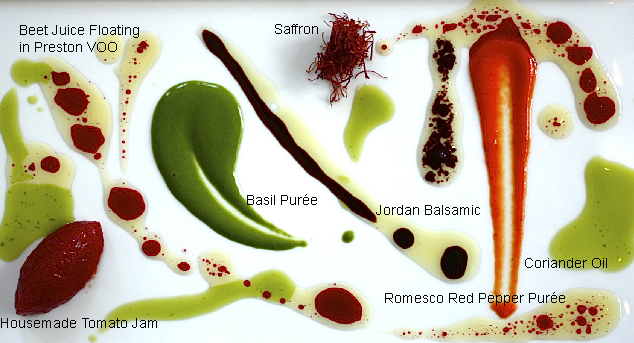 As food is plated the element that arguably demands the most finesse, (and in fine dining restaurants has its very own chef ) the final sauce, is added. Only after all these steps are completed does a chef reach for final finishing flavors which, if he isn't careful, can misrepresent or throw the complexity of the entire dish out the window. When I asked what flavors and textures he might look for in a garnish Ryan reeled off, “sharp, sweet, tart, viscous, buttery, floral, creamy, caramel, crunchy, earthy, herbal” adding he includes vinaigrettes as well. 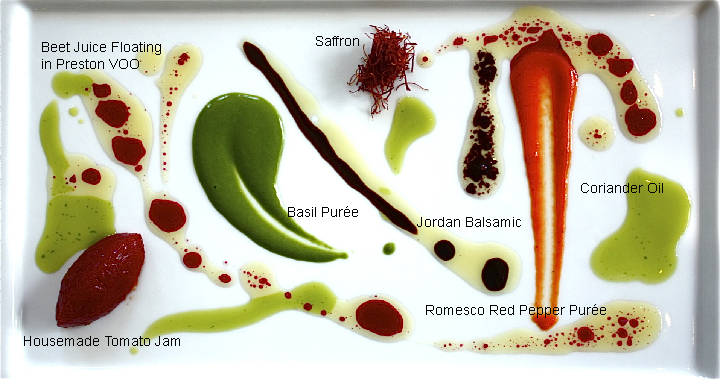 If you’ve dined at the Barn over the past few weeks you will recognize most of the elements photographed here which were used to garnish our plates one day last week; chances are if you come in next week they will have been replaced. For restaurants like ours that tout their farm to table pedigree, garniture offers a not-to-be-missed opportunity to showcase what’s local, seasonal and freshest. Towards this end we devote three raised beds here at the Barn just for finishing. 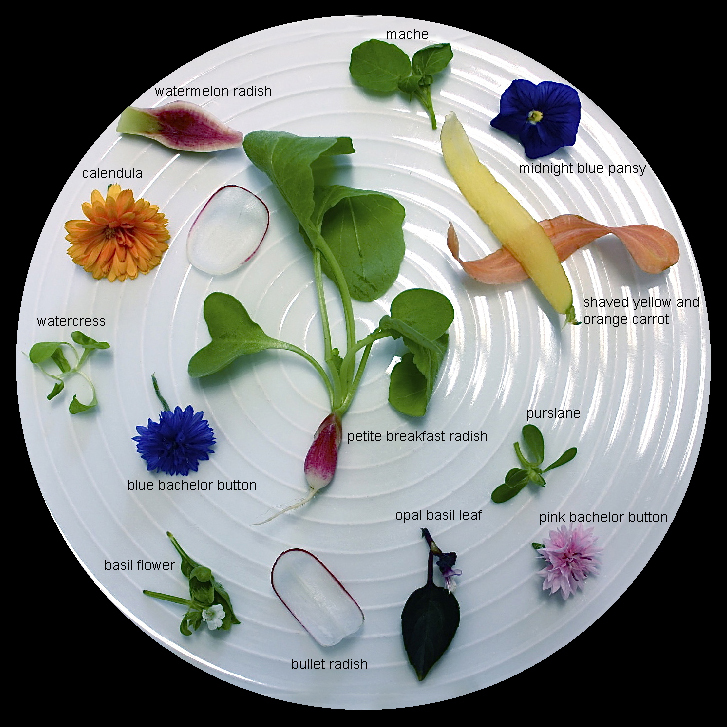 In addition to these edible flowers and herbs which Chef uses raw or infuses in oil and a range of vinegars, our farmer partners grow a variety of tiny vegetables and greens he may pickle or lightly dress. And let's not forget root vegetables which can be deep fried for a sprinkling of chips...once you see the potential of garnish, the list just keeps on growing. Grown or foraged or bought, finishing flavors are an essential, if ephemeral, piece to dining you owe it to yourself to explore. Whatever you call them. 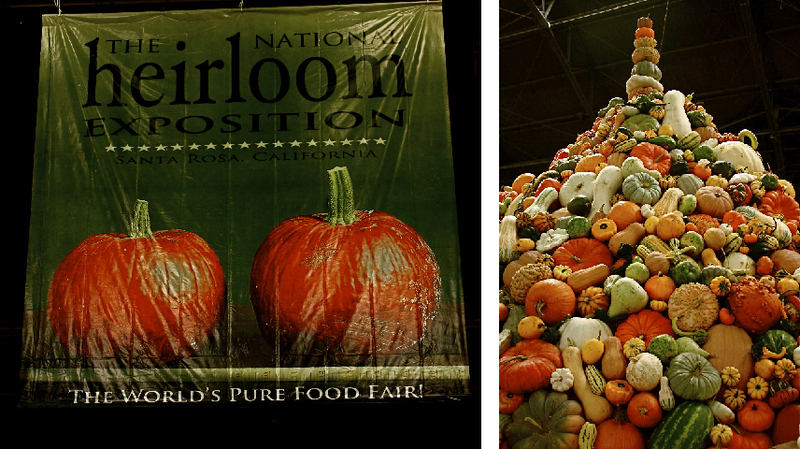 Expectations are running high for this week's first National Heirloom Expo ~ with good reason. 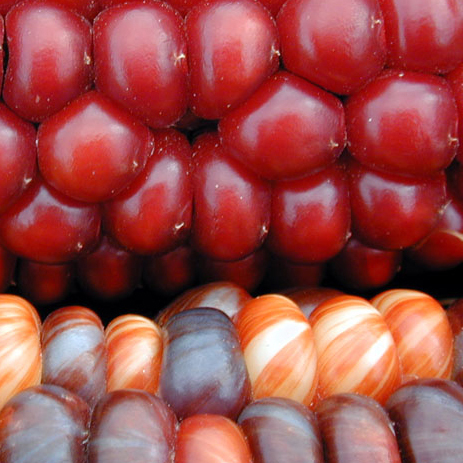 The time is right for a truly meaningful countywide event with a focus on seeds, farming and superlative products. The Expo starts Tuesday and runs through Thursday at the Santa Rosa Fairgrounds. Barndiva will be participating in the chef demonstrations (Ryan will be there today at 2, as well as Alex from Mix Gardens), and there will be scintillating panel discussions with food savants from around the country, in addition to keynotes speakers including Alice Waters and Dr. Vandana Shiva. If you've never heard Dr. Shiva (chances are you've never even heard OF her) don't miss this opportunity to experience this Nobel worthy woman who speaks truth to power about the future of food. Without a doubt one of the more interesting groups coming to the Expo are the folks from Native Seed/SEARCH, a seed saving educational non-profit that has been going strong in Arizona for over two decades. Native Seed's Bill McDorman will be speaking on Tuesday at 3, directly after Ryan's demo, and will also participate in an important panel Thursday called Seeds of Sustainability. 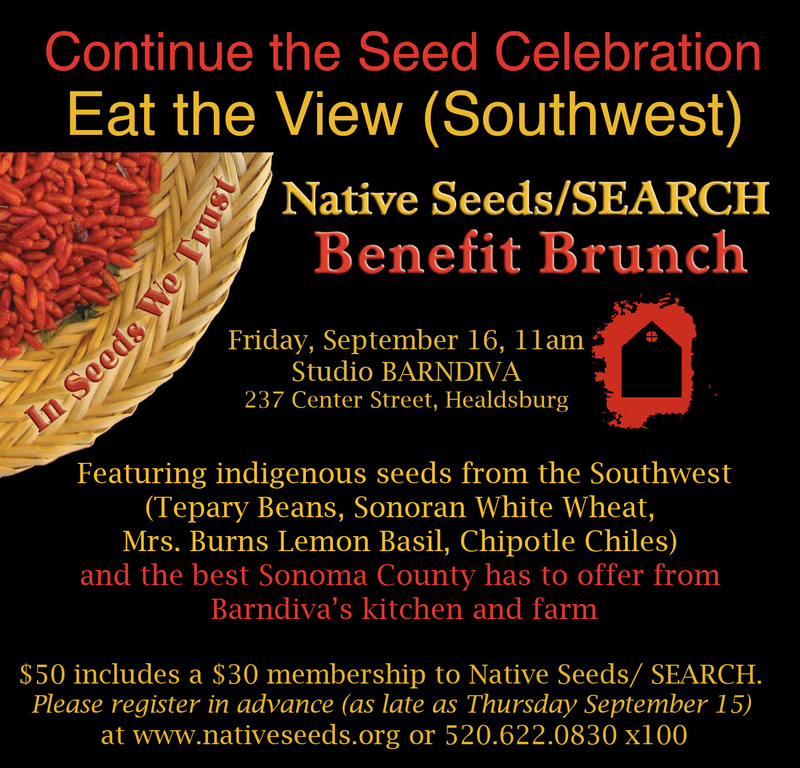 On Friday morning Studio Barndiva will host a benefit for the Native Seed/SEARCH organization with an incredible brunch starting at 11 using Native Seed products. Our pastry chef Octavio will be making muffins with their Senoran White Wheat, while Ryan and the gang will serve up our infamous Huevos Rancheros with Early Bird Eggs, heirloom salsa and Native Seed Tepary Beans. Bloody Marys, made with our tomatoes and their rare Native Seed spices will (quite literally) kick off the meal, after which there will be a chance to talk with Bill and his dynamic wife Belle Starr and many other seedsmen and women who were at the Expo and are coming for a last chance to compare notes. This is a not-to-be-missed event folks, with a great meal, in support of a wonderful organization. It just doesn't get any better. To book a place at the table, call Barndiva at 707 431 0100. See you there! See you here! Details below. We sent two of our biggest diva's ~ Isabel and Eric ~ to Taste of Sonoma a week ago to sing our song to a sold out crowd of 3,000. 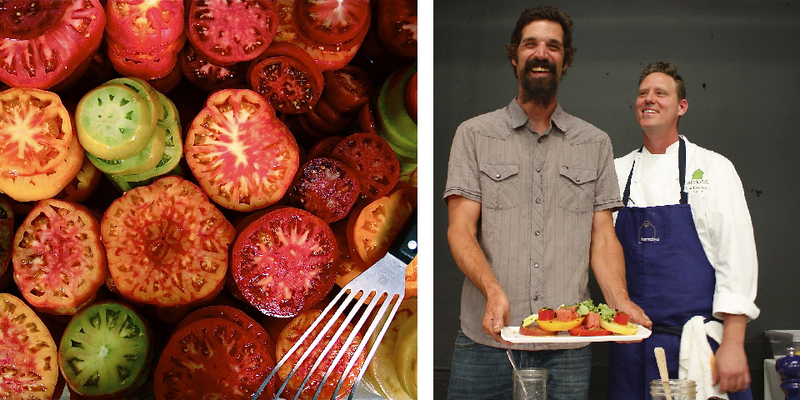 Good thing that in addition to our compressed watermelon + lemon verbena we also served up Barndiva Farm's Heirloom green figs and Gravenstein Apples ~ these terrior hunters were hungry, and not just for information. Taste is a great event ~ at the gorgeous MacMurray Ranch ~ in which to get a comprehensive overview of the wines produced across the county. We were in the Dry Creek Valley tent, but we couldn't help noticing while visiting friends in the other tents that there was decidedly less food this year. What's up, Chefs? We are busy as all get out this time of year but we made the time and are really glad we did. 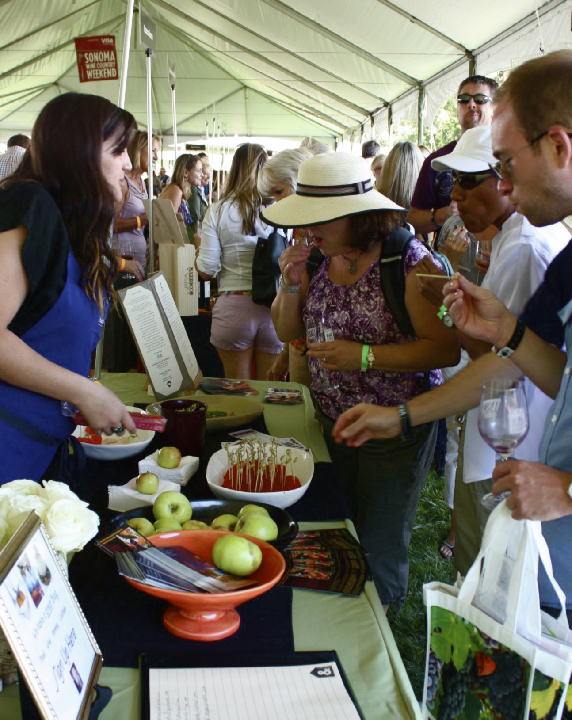 Not counting Pigs n' Pinot ~ which is one varietal and Healdsburg centric ~ Honor Comfort and the gang throw the most convivial wine event of the summer.